CALLAHEAD understands our clients desire to maintain the highest level of hygiene for their employees, guests and as well as themselves. Our HANDTOWEL DISPENSER is available to ensure our customers have the ability to maintain those hygienic standards. Studies have proven proper hand washing combined with the benefit of drying hands with disposable paper towels will help eliminate the spread of germs and bacteria. The HANDTOWEL DISPENSER is the perfect way to keep clean and minimize the risk of spreading germs when you wash your hands whether using soap and water or an antiseptic dispenser. 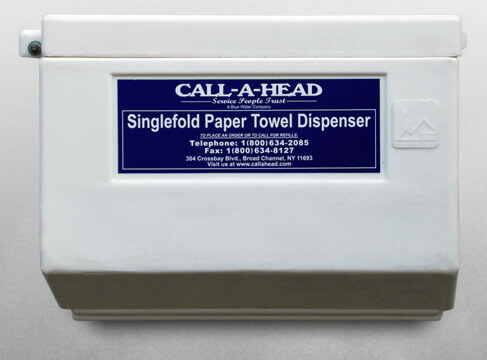 When CALLAHEAD researched hand towel dispensers for our clients it was obvious the HANDTOWEL DISPENSER is undoubtedly the most functional and durable on the market for the portable sanitation industry. 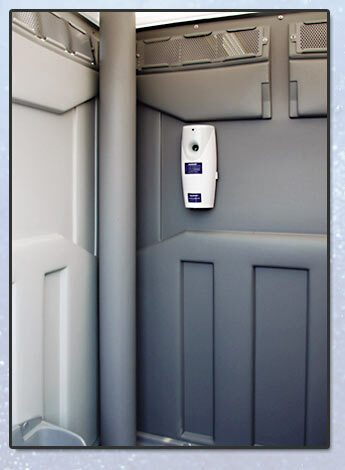 Portable restrooms are moved around vigorously and our HANDTOWEL DISPENSER, made of thick polyethylene ensures your dispenser is indestructible at any job-site or special event while keeping your paper towels protected. The dispenser is opened from the top to be refilled and seals firmly closed over the entire unit with a thick 1" lip cover to ensure your paper towels stay free from moisture, germs and bacteria. The bottom of the dispenser has an easy access opening so the user receives one paper towel at a time while the rest stay securely inside and won't fall out on to the floor. Since the HANDTOWEL DISPENSER is maintained and refilled with new paper towels as needed by CALLAHEAD, users will be able to dry their hands easily and conveniently to maximize their hygienic standards. Also, the paper towels supplied by CALLAHEAD are 100% biodegradable, which reduces the environmental impact. There are many benefits that come from using paper towels with the most obvious being paper towels are used once and thrown away and unable to harbor dangerous bacteria from other users. The HANDTOWEL DISPENSER ensures that your towels are kept in a clean safe place before use. The CALLAHEAD Corporation has and always will supply equipment that is of the highest quality as well as functionality for our customers' needs. We research all of the equipment to ensure maximum benefits for our clients so you know you will only receive the best equipment in the industry when renting from CALLAHEAD. Height: 7.5" • Width: 12" • Depth: 6.5" • Width to Dispense towels: 9.25" • Color: White with navy blue signage • Material: Thick Polyethylene • Capacity: 250 single fold towels. Heavy duty thick polyethylene material which makes this dispenser indestructible. • Top cover closes securely over entire dispenser to conceal any moisture, germs or bacteria from entering and there is no contamination to the paper towels. • Stainless steel bolted hinge. • Single fold paper towels with easy access at the bottom to receive one towel at a time and the others won't fall out. • Maximizes your sanitation with 100% biodegradable disposable paper towels to accompany CALLAHEAD'S portable restrooms, antiseptic or soap dispensers. • Refilled and maintained by CALLAHEAD. • Available daily, weekly or monthly.